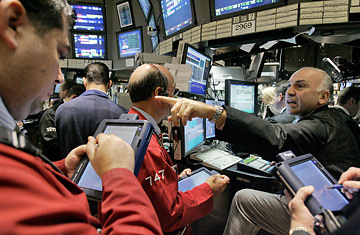 Traders work on the floor of the New York Stock Exchange, August 16, 2007. Looks like Wall Street's mad scientists have blown up the lab again. The subprime mess that is cutting so wide a swath through financial markets can be traced to the alchemy of creating collateralized debt obligations (CDOs) compounded by the enormous amount of leverage applied by big hedge funds. CDOs are derivatives  synthetic financial instruments derived from another asset. Here's the recipe for a CDO: you package a bunch of low-rated debt like subprime mortgages and then break the package into pieces, called tranches. Then, you pay to play. Some of the pieces are the first in line to get hit by any defaults, so they offer relatively high yields; others are last to get hit, with correspondingly lower yields. The alchemy begins when rating agencies such as Standard & Poor's and Fitch Ratings wave their magic wand over these top tranches and declare them to be a golden AAA rated. Top shelf. If you want to own AAA debt, CDOs have been about the only place to go; hardly any corporation can muster the credit worthiness to garner an AAA rating anymore. Here's where the potion gets its poison potential. Some individual parts of CDOs are about as base as bonds can be  some are not even investment grade. The assumption has been that even if the toxic waste bonds really stink, the quality tranches can keep the CDO above water. And life goes on. The problem is that CDOs were untested; there was not much history to suggest CDOs would behave the same way as AAA corporate bonds. After all, the last few stress-free years have not exactly provided much of a testing ground for what can go wrong  until, that is, subprime mortgages started their death march. Suddenly, investors realized things can actually head south in a big way, even stuff completely unrelated to CDOs. Like your stocks. It's not the first time this has happened, yet Wall Street still isn't getting the message. One August day nine years ago, Russian bonds defaulted. A surprising result of this default was the spectacular failure of Long-Term Capital Management (LTCM), a hedge fund in Greenwich, Conn. Surprising because LTCM had nary a penny in Russian bonds. They nearly took the global financial structure with them. Today we're seeing another improbable linkage. A number of hedge funds are failing; others are seeing returns plunge. Among these is Goldman Sachs's flagship Global Alpha Fund, which burned a quarter of its $10 billion value over the last few weeks. And just as LTCM was free of the Russian debt that precipitated its collapse, Global Alpha was not a player in subprime junk. Indeed, Global Alpha's problems have not come from mortgages at all, but from a portfolio of stocks. Why does this happen? Why is a hedge fund like Global Alpha affected by events in markets far removed from its bread-and-butter exposure? The root of the problem is high leverage. For example, when this debacle hit, one of Goldman's funds was leveraged 6 to 1, so every dollar of investor capital claimed six dollars of positions. This is the dry kindling for a market firestorm. When things go bad for a highly leveraged hedge fund, it gets a margin call and has to sell assets to reduce its exposure. Naturally, as it sells, prices drop. The falling prices mean a further decline in the fund's collateral, forcing yet more selling. And so goes the downward cycle. Hedge funds that hold the toxic CDOs can easily undermine those that don't. It can be difficult to sell the stuff that's causing the problem; those markets are beyond redemption. So if you can't sell what you want to sell, you sell what you can sell. The fund looks at its other holdings, focusing on the more liquid positions and reduces its exposure there. This causes pressure on these markets, markets that have nothing to do with the original problem, other than the fact that they happened to be held by the fund that got in trouble. Now that these markets are feeling the heat, other highly leveraged funds with similar exposure will have to sell. This leads to another cycle of selling, but in what was up to that point a healthy market unrelated to the initial turmoil. As the subprime crisis propagates, it doesn't matter that some instruments are fundamentally strong and others are weak. What matters is who owns what, who is under pressure and what else they own. Hedge funds are constantly shifting their exposure, so it is difficult to predict the course a crisis will take. But if you are a highly leveraged fund precariously perched as these dominos fall  as Goldman's are today and as LTCM was in 1998  you become part of the game. And if you are both highly leveraged and big, the problem that started in one insignificant little segment will now become your problem, and a much bigger one. Again, it's all about leverage. This is the case for crises in the past and will be the case for crises in the future. A world in which highly leveraged hedge funds share similar strategies makes it inevitable that what we are seeing now will occur again. And the more complex the strategies, the more surprising the linkages that will emerge. Yet, incredibly, despite the risk this poses, no one keeps watch over leverage. No regulator knows how much leverage the hedge funds have or how that leverage is changing. The lesson this time around with Global Alpha is the same as it was with LTCM. But we seem to be slow on the uptake. These funds hired the best and the brightest, yet they became embroiled in crises largely of their own making. If it could happen to them, it will happen again. And we'll all share in the consequences. Again. Bookstaber has run a quantitative equity hedge fund and has overseen risk management at several large hedge funds and investment banks. He is the author of A Demon of Our Own Design (Wiley, 2007). He can be reached through his blog rick.bookstaber.com.